Is your skin prone to being oily and acne ridden? If so, you aren’t alone. In fact, the American Academy of Dermatology says that acne is the most common skin condition in the U.S., and the costs associated with treating this condition are more than $3 billion. Yikes! Today, I’d like to help you save a little cash by introducing you to a natural homemade face scrub recipe that can help with oily and/or acne prone skin. 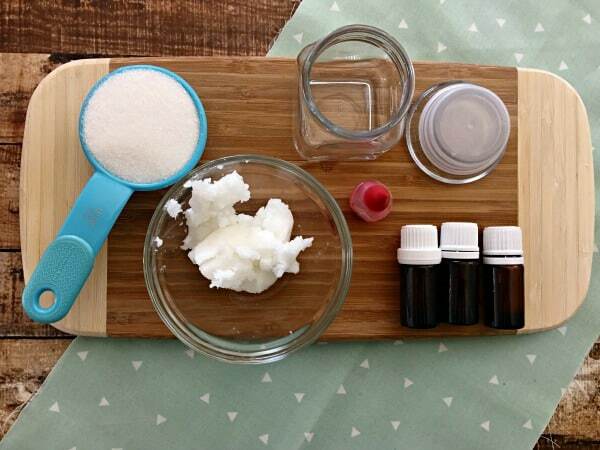 This homemade acne face scrub is one of my favorites due to how effective it is. The power of this natural homemade face scrub is thanks, in part, to the grapefruit essential oil it contains. Grapefruits are awesome. More specifically, they are rich in antioxidants and promote the production of collagen, both of which fight off the signs of aging. However, above and beyond that, grapefruit has astringent and exfoliating characteristics that are fabulous for clearing up oily skin and acne outbreaks. Are you starting to see why this homemade acne face scrub deserves that prime real estate in your bathroom? Another thing that earns this natural homemade face scrub brownie points in my book is its lack of chemicals. I can pronounce each and every ingredient which is refreshing. When you look at some of the face scrubs at your local drug store, you’ll quickly find words that should be sudden-death round questions at the National Spelling Bee! 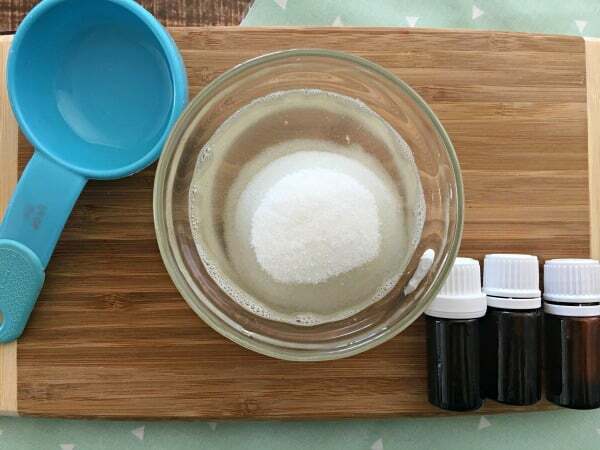 In addition to kicking acne to the curb without the use of mysterious, unpronounceable ingredients, this homemade acne face scrub is easy to make. The only appliance you need is a microwave to melt the coconut oil. That’s my kind of recipe! 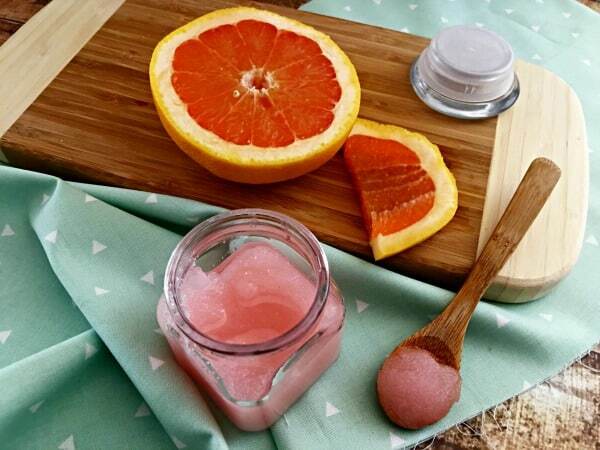 A word of warning though, since grapefruit is a citrus, this natural homemade face scrub may not be a great option for someone suffering from rosacea or very sensitive skin. 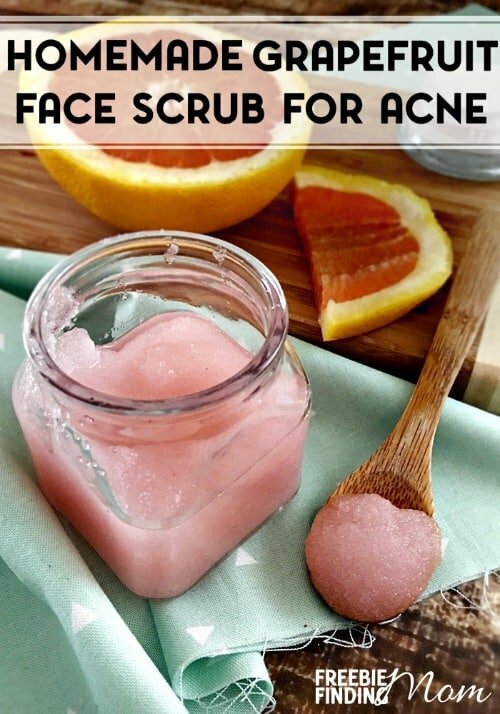 Since grapefruit essential oil can be an irritant in certain situations, this homemade acne face scrub should not be used around the eyes or if you are pregnant. If you fall into this category, don’t get discouraged. 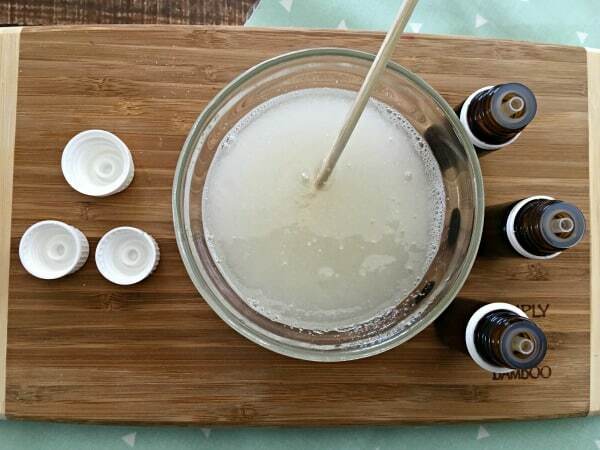 There are plenty of other natural homemade face scrubs you can try to clear up acne. 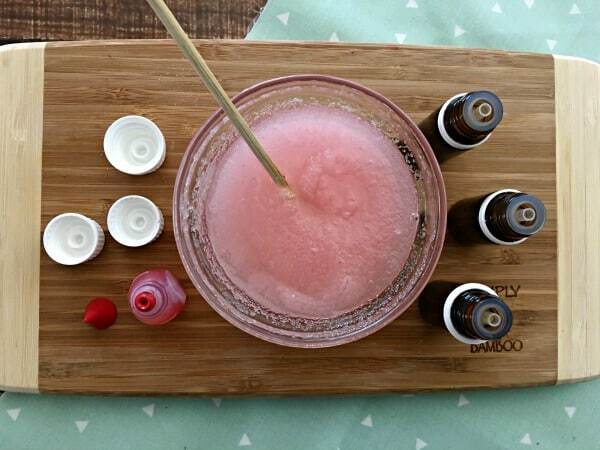 Start by checking out this recipe for strawberry face scrub. If you have a condition other than acne or are just looking for an anti-aging face scrub, this homemade acne face scrub may not be your best option. Instead try one of these 5 homemade beauty face masks. Okay, enough talk, let’s start fighting acne! 1. Add coconut oil to a small microwave-safe dish and heat in the microwave for about 30-45 seconds or until melted. 2. Mix sugar into melted coconut oil. 3. Add grapefruit essential oil, frankincense essential oil, and tea tree essential oil to coconut oil mixture and combine. 4. Stir in a very small drop of red food coloring. 5. Scoop mixture into 4 oz. glass container. 1. Use a teaspoon to scoop grapefruit scrub out of container. 2. 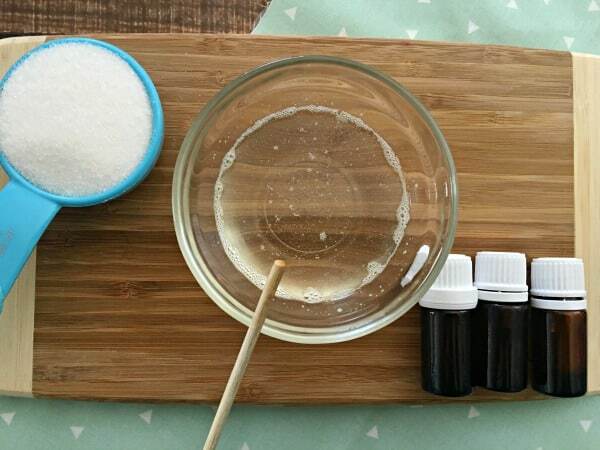 Rub natural homemade face scrub into skin. Warning: Some individuals have reported skin irritation when using grapefruit essential oil before strong sun exposure. To prevent any irritation, use this natural homemade face scrub at night (before bed), or at the very least, be sure to wait a while before exposing your skin to bright, direct sunlight. You should also follow Freebie Finding Mom’s DIY Beauty and Homemade Beauty Products Pinterest boards. Can I replace the frankincense oil with anything? I have everything but that unfortunately. Thanks for this recipe! Since going natural I miss the smell of the good old pink grapefruit Neutrogena face wash but don’t miss the chemicals. I can’t wait to try this! One suggestion I have is for an awesome natural colorant! If you use a pinch of dried hibiscus/ or empty an Organic hibiscus tea into the mask mix it will naturally turn it bright pink and has amazing benefits for your skin also! Tons of vitamin A (it is called the BOTOX plant! ), and as many antioxidants as blueberries. The color is so wonderful and the dried bits would also help exfoliate. Or you could just let the dried flower soak in some water and strain it & add a tablespoon or so just for some color. I don’t know the benefits of it but I have also seen people use beet root and it’s gorgeous! Just some ideas for naturally coloring it. Thanks again for this recipe I’m so excited! I thought coconut oil was comedogenic? Is there another oil I can use? Thank you. Can you use lemon or orange instead of grapefruit?